I absolutley recommend drinking tons of filtered water for clear skin. There is a supplement I take every day and I swear it makes my skin rosy and I look younger. More Youthful. Astaxanthin. Its incredible. It is naturally occurring in Salmon. I prefer a maga dose to make sure I get enough. Its also a natural sunscreen. Astaxanthin comes from the microalgae haematococcus pluvialis, found in abundance in arctic marine environments, and is a natural carotenoid (any of a class of yellow to red pigments, including the carotenes and the xanthophylls). Carotenoids are one of the most abundant molecules in the world and give nature its wide variety of colors—from carrots to flamingos. It is the most potent of all of the carotenoids—in fact it is ten times stronger than beta carotene and 100 times stronger than Vitamin E. Wild Alaskan salmon, lobster, rainbow trout, shrimp, crawfish, crab, and red caviar all owe their rich colors to their astaxanthin-rich diets. Astaxanthin is an exceptional anti-inflammatory, making it an important component of the Perricone Weight Loss Diet. Its ability to protect muscles and increase physical endurance is a wonderful asset for everyone needing to start and maintain a regular exercise program. Because astaxanthin has been proven to cross the blood brain barrier (see Carnitine below), it offers protection to the brain, the central nervous system and the eye. It increases physical endurance and reduces muscle damage. It reduces eye fatigue and improves visual acuity. It provides wrinkle reduction by internal supplementation. It reduces hyperpigmentation (better known as age spots). It provides cytokine regulation; inhibiting the expression of inflammatory cytokines and chemokines. It improves gastric health; and reduces infection/inflammation of H. pylori, spiral-shaped bacterium that can damage stomach and duodenal tissue, causing ulcers. Dr Oz did a segment with Dr Joseph Mercola called “The #1 Supplement You’ve Never Heard of That You Should Be Taking.” This crucial supplement is something called Astaxanthin, which Doctor Oz had not heard much about until Dr Joe Mercola spoke about it. Also, checkout the recap of the segment Dr Oz did with Dr Mercola about Alternative Medicine Breakthroughs! Dr Oz: What is Astaxanthin? Dr Joseph Mercola said that Astaxanthin is a cousin to Beta Carotene, but it is much more potent. Astaxanthin is derived from algae and is what gives flamingo their pink color (yes, flamingos are actually born white – not pink!). 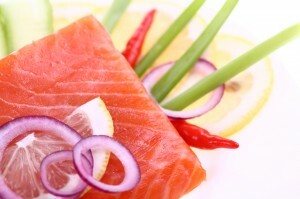 Astaxanthin also help to give salmon fish their pink color. Dr Mercola said that this is fairly new to the public, but it is one of the most potent anti-inflammatories that exists and it is crucial for people with cardiovascular diseases, cancer, arthritis, and many other medical concerns. Dr Mercola told Dr Oz that Astaxanthin has even been proven to help prevent eye cataracts, which is a common problem in older people. Even athletes love Astaxanthin because it helps to improve their performance. Astaxanthin has 15-60 times more potent antioxidants than either Vitamin C or Vitamin E.
Dr Joseph Mercola told Dr Oz that you should take 10 mg of Astaxanthin daily. Also, Astaxanthin is fat soluble, so you must take it with a meal that has some fat in it – otherwise, your body will not be able to absorb it.